Known as a city for all-ages, Port St Lucie grew from a mere 300 residents in 1970 to more than 185,000 people today. Development was a very big factor in this—until the housing market collapsed in 2007. By 2008, some 11,000 homes in the area were in foreclosure and unemployment topped 10%. Things have turned somewhat around since then, with a number of new business developments on the horizon. However, a lot of people are still dealing with the financial aftereffects. If you’re among them and debt has become a debilitating issue in your life, there are a number of consolidation solutions available to help you find financial freedom. Port St. Lucie residents with too much consumer debt have a number of choices when it comes to seeking relief. Depending upon your situation, some options will be a better fit than others. These are among the most common strategies. For more information, call a Freedom Debt Relief specialist today at 800-910-0065. Are you deep in debt, but honestly can’t keep up with the various payments due? If you are burdened with more than $10,000 in debt, getting a consolidation loan to cover your obligations is a good way to go. You’ll make a single payment each month instead of dealing with multiple bills. If your credit score is still strong, you might qualify for a better interest rate as well. Debt consolidation is for Port St Lucie residents who want to make sense of the madness, and simplify their debts so they can be paid off more easily. If you have a lot of debt and making the minimum payments on it has become out of reach, debt settlement could well be your best play. 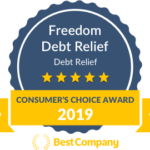 Under a debt relief program, you’ll consult with a company like Freedom Debt Relief to negotiate reduced settlement amounts with your creditors. It’s a bit involved, but many people have benefitted from this approach all over Florida. Other strategies available to Port St. Lucie denizens include minimum payment plans and bankruptcy, though both have rather significant cons. The former will find you paying a lot more to resolve your debt, as interest charges will mount tremendously. Meanwhile, the latter will leave a scar on your credit report for 10 years. If your head is still above water, but the tide is rising fast, look into debt counseling. Debt counselors can help you assess and reprioritize your budget to better cover your obligations and your household expenses. In some situations, debt counselors will also recommend debt management, wherein they’ll negotiate lower interest rates with your creditors and take over payment of your bills to ensure compliance with the agreements they reach. With all of the recent growth in the area—and new developments on the horizon—things are looking brighter in Port St. Lucie today than they have in many years. Still, it’s hard to feel optimistic with crippling debt hanging over you. While likely of little solace, lots of other people have been in the same boat. The good news is thousands of them found consolidation solutions with a simple phone call. You can too. Freedom Debt Relief has people standing by seven days a week to help you. Call 800-910-0065 to get your free evaluation today.